A five reel and three row slot game, Lost Island has 20 pre-set paylines and a theoretical return to player percentage of 96.5%. Within its gameplay the slot also features wild substitutions, free spins and a multiplier which can serve to dramatically increase what is already a very respectable top jackpot. 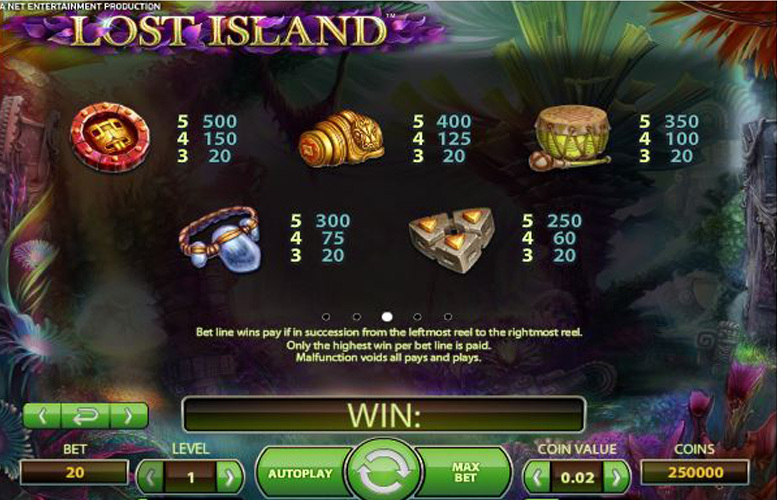 Taking a mythical and long forgotten island as its theme, Lost Island is a slot game with plenty to offer to players. To help you decide whether it is the game for you, we have compiled a brief guide to its top jackpot, special symbols, paytable and betting limits, and you will find all that information beneath. 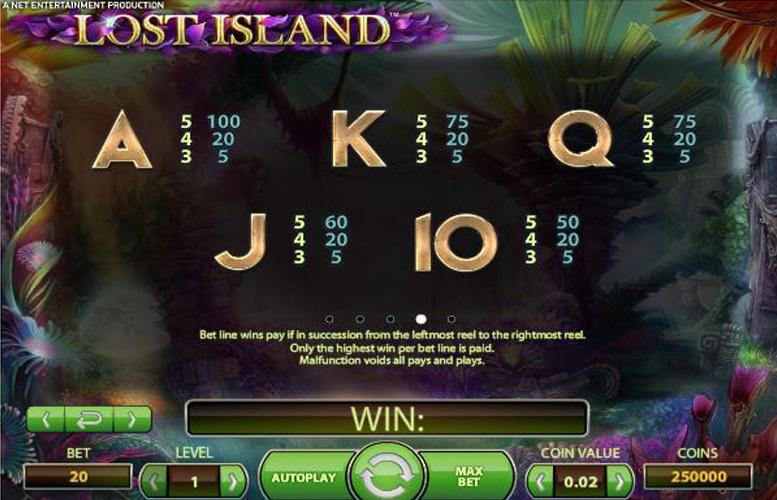 Lost Island is a traditional style five reel slot game, which pays out on payline combinations featuring three or more identical symbols consecutively from left to right across the reels. The most valuable combinations are those featuring five identical symbols and it is the circular mask symbol which provides the highest rewards. Five of those most valuable symbols in combination pay at a rate of 500 times the bet level, meaning that at the highest bet level of ten the payout per line can be 5000 coins. If five Wild symbols (more on them later) appear on the reels, however, that applies a x 5 multiplier to the winnings and that means 25,000 coins per line can be won. If the same combination appears across all 20 paylines, then, and five wilds are still in evidence, a top jackpot of 500,000 coins will result. At the top coin value setting of 50p, that jackpot is worth a whopping £250,000 to the player. 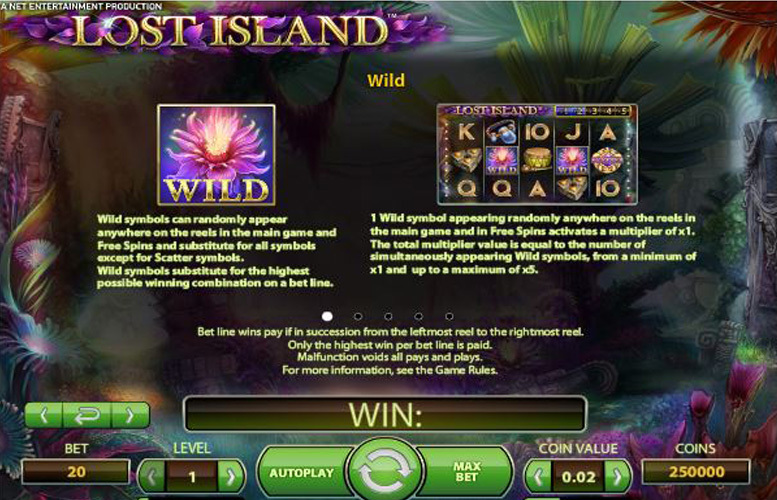 There are just two special symbols featured as part of the Lost Island slot but they do both serve to trigger fun and potentially fruitful features for players. Wild Symbol – the first of the special symbols is the Wild symbol, which in many ways works in exactly the same way as a traditional wild. The symbols can appear anywhere on any reels, substitute for all other symbols apart from the Scatter symbol and go towards making up the most valuable combination for any payline. Within Lost Island, however, the Wilds also have another purpose in that they fuel the game’s multiplier. If two wilds appear, that multiplier is x 2, if three appear it is x 3, if four appear it is x 4 and if five or more appear it reaches x 5. It is through this function, therefore, that Lost Island Wilds can prove especially rewarding. 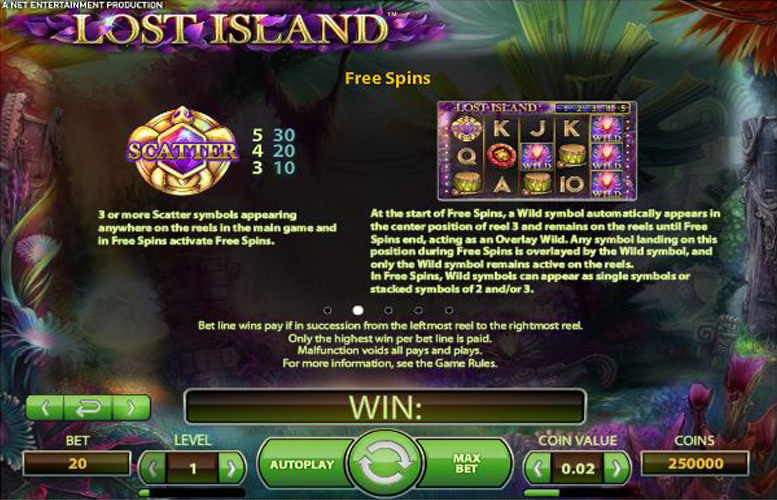 Scatter Symbol – aside from those Wild symbols, the only other special symbol in the Lost Island slot is its Scatter symbol. Those symbols serve the purpose of triggering free spins and the number of free spins activated depends upon how many Scatters appear on the reels. Three Scatter symbols trigger ten free spins, four result in 20 and five award a total of 30 to the player. All free spins are played at the same bet level and coin value as the spin which triggered them and additional free spins can be won through the free spins themselves. The symbols found on the Lost Island reel are all supposedly items found in and around an abandoned island civilisation, and the most valuable combination is that made up of five of the circular mask symbol. Five of those symbols pays out at a rate of 500 times the bet level which results in winnings of 5,000 coins per payline at the highest bet level or of 25,000 if the maximum x 5 multiplier is applied. If the above circumstances are replicated for each and every one of the game’s 20 paylines, therefore, a total payout of 500,000 coins can result. The next most valuable symbol is the golden serpent jewellery symbol and five of these pay out at a similarly generous rate of 400 times the bet level. That combination, then, can provide winnings up to 20,000 coins per line and 400,000 in total. Lost Island players cannot alter the number of paylines that are active per spin but they do have control over both the coin value and the bet level. Coin value dictates how much each coin is worth and there are six options ranging from 1p to 50p. Bet level sets how many coins are wagered per payline and this can be set anywhere between one and ten. To wager the minimum possible, therefore, a player can set a bet level of one and a coin value of 1p, resulting in a total stake of 20p. If they want to bet the maximum, meanwhile, they can set a bet level of ten and a coin value of 50p to wager a total of £100 per spin. 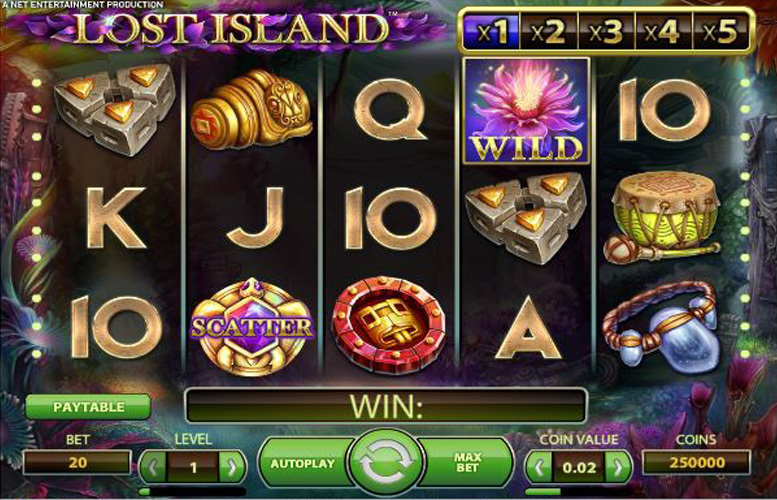 Lost Island is a slot game with an attractive theme, beneficial bonus features and a very generous top jackpot. As such, there is very little not to like about it and the vast majority of players are likely to find it a really good option. Providing a potential top jackpot that can be worth up to £250,000, the game provides payouts that compare favourably with other slots on the market, and the next most valuable combinations are similarly impressive. Features such as free spins and the multiplier linked to the game’s Wild symbols also serve to improve a player’s chances of winning but these are the only features present. That may mean that for players who like bonus games and other special features, Lost Island is a little lacking. This game has a rating of 4 / 5 with 293 total reviews by the users.